From the moment the performers entered the theater until they took their last bow, I was completely amazed and mesmerized. We all know The Lion King. 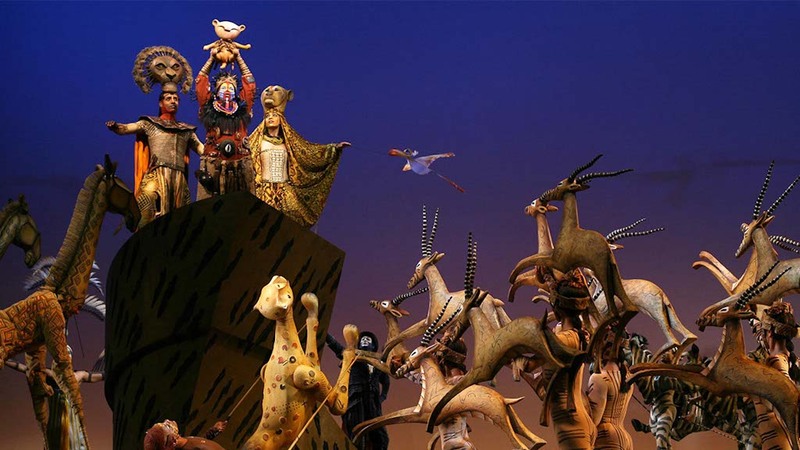 We can sing along with the songs and most of us still get choked up when Mufasa dies, but The Lion King Musical is an amazing Disney production combined with the greatest, most creative, costumes, puppets and performers in musical theater. Last night, we attended the production at Segerstrom Center for the Arts and everything from the shadow puppets to the brilliantly designed costumes, from the performers to the songs, showed the brilliance of The Lion King Musical. Athena was nervous when we sat in our seats. There were drums and a dark red curtain that gave her an eerie feel. I thought she might want to leave or at best sit on my lap the entire production. I second guessed bringing her. I couldn’t have been more wrong. It opened with Rafiki summoning all of the animals to Pride Rock, which triggered a massive procession of beautiful creatures including giraffes, leopards, birds, zebras, gazelles and our favorite – the elephant with its calf. At first, Athena had her head down but she caught the birds almost magically flying above us out of the corner of her eye and she couldn’t help but look up. When the graceful giraffes came on stage, she was mesmerized and when Rafiki lifted Simba up for the animals and the crowd to see, she stood and enthusiastically clapped. I didn’t have to prompt her. She was bursting with emotion. They had been performing for under 15 minutes, but it was already worth it. We, too, had a similar sense of awe that never left the entire night. I was impressed with the body movements of the performers. They were animalistic and graceful, but there were a few that performed so well I could only picture an animal and the person faded away. Watching the cheetah and the giraffes was magical. You can imagine yourself on the plains of Africa and it’s easy to become engulfed in the performances. Timon and Pumbaa were quite remarkable as well. Timon is a full-sized meerkat puppet who is operated by Nick Cordileone from behind. 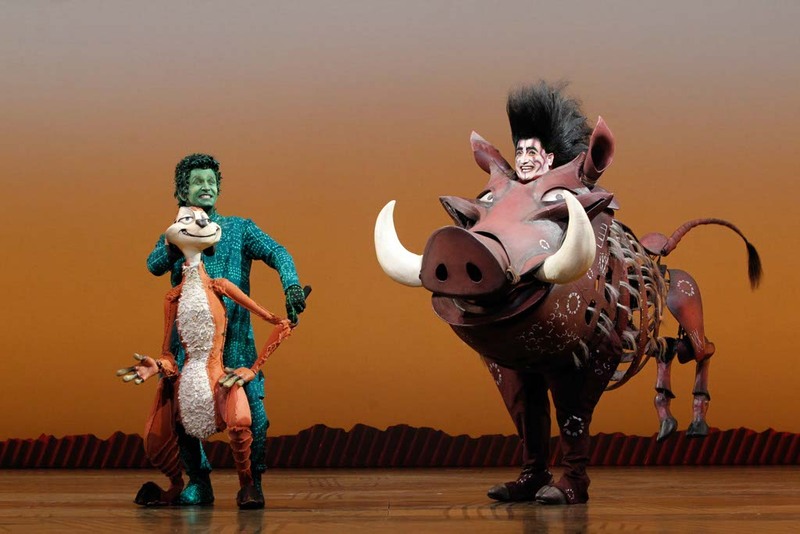 Pumbaa is an incredibly large warthog with actor Ben Lipitz encased in a part costume, part puppet creation. They cracked me up in the movie and they didn’t disappoint in the musical. Just looking at Pumbaa makes me laugh and Nick Cordileone was perfect for the part. It was Rafiki’s voice and stage presence that left me speechless. Who doesn’t love the old, crazy monkey, right? But Mukelisiwe Goba brought us to Africa. 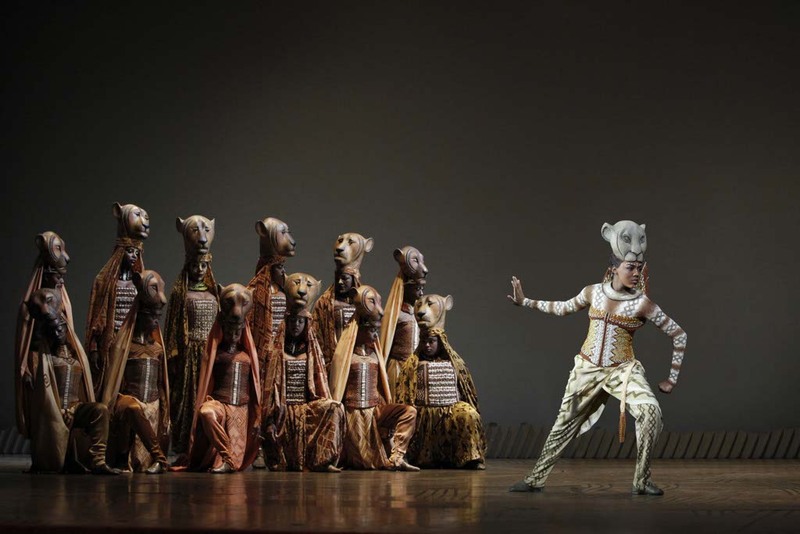 The Lion King Musical includes audiences of all ages and backgrounds. It gives depth and shape to a production that we already love. I don’t know how I went all this time without seeing it, but experiencing it with Athena was far greater than anything I imagined. Watching her stand and cheer at the end of the show like she did at the beginning was a moment worth waiting for. Take your spouse; take your kids; take your parents; take your friends. Everyone will fall in love with the musical as much as we did. I completely agree! My husband and I saw it in London 10 years ago and it has still stayed with me. I saw Wicked a couple years ago and I have been saying it is the best musical production but I think The Lion King passes it. Have you seen Wicked as well? This went wild when it came out in Vegas a few years ago! I didn’t know why I didn’t watch it then when I was actually living there. Kind of regret that now. They tour. Maybe it will be in your city at some point. Have you looked at their schedule? Wow, that looks amazing. I’d love to see the lion king, it was the first film I saw in the cinema as a kid, and is still a favourite of mine. I remember the first time I watched it as a kid too. It has always been one of my favorites. 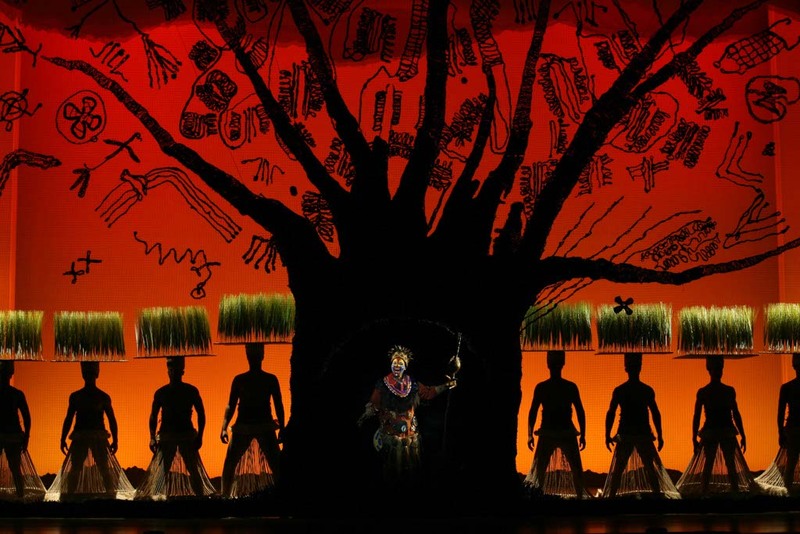 Awesome review – I went and saw the Lion King on stage in Sydney and LOVED every second of it. 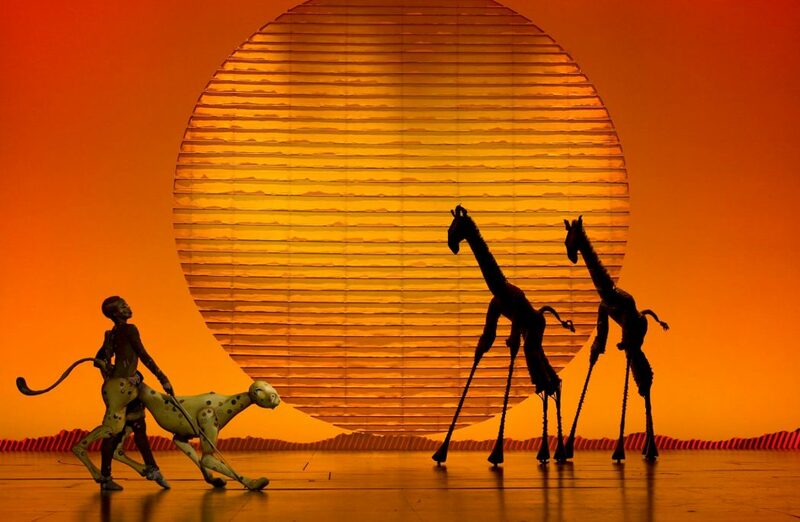 My husband isn’t a muscial theatre fan at all but this went beyond a regular stage show experience – the costumes and the sets and the lighting transported us to Africa – it was one of the most phenomenal nights of our lives!! Luckily, my husband really enjoys coming to the theater with me. We go on a regular basis. Segerstrom Center for the Arts is only a short drive for us and they always have amazing productions. Wonderful review. I saw the Lion King in Singapore and it was so fantastic. I’ve also seen in in NY and fall in love with it more every time I see it. My husband laughs because I start to cry during the opening act when they walk down the isles singing. I’m a bit of a sap! It was the first time I saw the musical but if I have the opportunity again, I’d go back for sure. Oh how I really want to see the Lion King musical ! I’ve heard so much of it and your description just make it sounds great! The only Disney one I’ve seen was Mulan but that was such a long time ago and I remember being very impressed but the Lion King just look so visually stunning! You saw Mulan as a musical? I’d love that! Where was it? you managed to take some incredible shots, they are marketing worthy! They are from the PR 😉 They are linked through photo tagging. I only had the difficult task of choosing haha. Its so cute…. would love to attend such show. Definately in my bucket list. It looks a fun way to spend an evening! I totally agree that it’s a must see. The costumes are unreal. It’s just put together so well. The opening scene with the elephants is my favorite. I can’t believe how amazing those costumers are! It really is magical. Have you been to any other musicals? Glad Athena had such a great time! I can see where you would be nervous, but glad it turned out well! We saw it a few years ago and absolutely loved it, too! Such a great show. We also found out this past year that the set was designed and created in our hometown, Minneapolis–we toured the Orpheum Theater and saw where it was created and how they put it all together–so cool!! Ah, this has been on my list as well! I haven’t made it happen yet, hopefully this year. So glad you all loved it. You got some great shots! You know, you really sold me with this post. I am gaga over musicals and have seen probably close to 100 but NOT the Lion King. I will have to watch for it to tour (I know there are many of them) and go see it. Thanks for the very well written review. I saw the Lion King at Pantages Theater about 10 years ago and absolutely loved it! Also, I’m pretty sure one of the cast members was flirting with me during the Circle of Life number, lol! Great musical. Love the Lion King musical! Saw it the first time in Toronto almost exactly 15 years ago for my older daughter’s 4th birthday. It’s such a fabulous production and I love that it’s still going strong! we saw a touring Broadway production in Boston. It was moving and my daughter loved it. I personally am not a huge fan of musical theater but I too would recommend to experience this show with kids of any ages. It’s beautifully put on, isn’t it? It’s been a huge success in London for some years and the audiences keep coming! Hubs took me to see The Lion King years ago, long before we had kids. I loved it so much then, and I’d love for my kids to see it one day!